Arrived early morning in Casablanca – didn’t expect it to be foggy like San Francisco. By lunchtime it had burned off. It’s the major Muslim feast of Eid al-Adha – an Islamic festival to commemorate the willingness of Ibrahim (also known as Abraham) to follow Allah’s (God’s) command to sacrifice his son Ishmael. So many people are taking holidays and many stores are closed. The medina is quiet but we do be a few stalls open. In North Africa, the medina is the oldest part of a city and is typically walled, with many narrow and maze like streets. Our guide Abdul. He was awesome – so knowledgeable and very fluent in English. A coffee in the square after shopping. It was very safe and friendly walking around. Casablanca has a strong western influence but you can still definitely tell your in Africa. 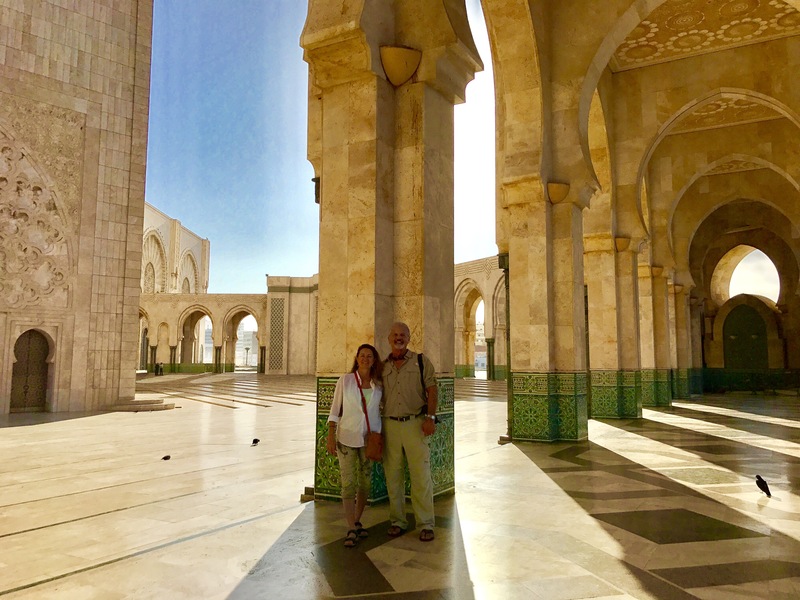 We visited the magnificent Hassan II mosque built in 1987 on the Casablanca seafront. I don’t believe I’ve ever seen such an imposing modern structure. So immense (fits 35,000 inside!) yet such artistic detail and majesty. It’s the 3rd largest mosque in the world and one of only two in Morocco that non- Muslims can enter. Beautiful archways and fine marble. The huge interior space – by the way, it has an automated roof that can open to let the sunshine pour in. The grand entrance with it’s beautifully ornate doors. We traveled on towards Fes stopping for lunch at a winery (Chateau Roslane) near Meknes. They have been making in the region since the Romans arrived around 2,000 year ago. The local cuisine and wine were excellent! Volubilis grew to prominence as the ancient Roman capital of Mauritania (now contained within Morocco and Algeria). It was a large colonial town on the fringes of the Roman Empire. The ruins contain mosaics, columns, arches, the remains of a big temple and a basilica, some town villas and palaces. The region was a large exporter of grain for the Empire. Perched atop a hill, it provides panoramic views of the area. Fes el Bali is a UNESCO World Heritage Site, and was founded in the 9th century. Home to the oldest university in the world, Fes reached its height in the 13th–14th centuries under the Merinids, when it replaced Marrakech as the capital of the kingdom. The urban fabric and the principal monuments in the medina – madrasas (colleges/schools), fondouks (artisan workshops), palaces, residences, mosques and fountains – date from this period. Although the political capital of Morocco was transferred to Rabat in 1912, Fes has retained its status as the country’s cultural and spiritual center. Leather works in Fes medina. They provide bunches of fresh mint as you walk in to offset the strong smell of the leather making in progress. Lunch at a the riad Palais Amani (a riad is a traditional Moroccan house or palace with an interior garden or courtyard) that is now a beautiful luxury hotel. It’s a Virtuoso property – a great place to be spoiled! Fes is noted for it’s traditional pottery. Artisans at work on mosaics and pottery. We headed on our luxury coach down the long road towards the South, through the immense cedar forests of the Middle Atlas, home to the Barbary monkeys. It’s pretty rare, we were told, to happen on a troop while driving through the forest so we were really glad and appreciative to get a close up glimpse of these little guys! On arrival in Erfoud, 4×4 Jeeps took us for a drive through the dunes of Erg Chebbi in Merzouga, possibly the largest ones in the Sahara Desert. The dunes arise mystical and serene atop the flat desert landscape. Within site of our encampment – we switch from our modern air conditioned vehicles to our “ships of the desert” – camels! to trek the remaining distance to the campsite over the dunes in ancient fashion. Our Tuareg guides give us some tips on how to mount and ride and lead the way. The Tuaregs have been called the “blue people” for the indigo-dye colored clothes they traditionally wear and which stains their skin. A semi-nomadic Muslim people, they are believed to be descendants of the Berber natives of North Africa. How to mount your camel! Trekking through the Sahara at sunset. Our encampment where we were fed a sumptuous dinner (…with chilled wine!) accompanied with traditional Moroccan music by camp fire. Tents were “glamping” style – complete with king size beds, carpets, bathroom with shower and toilet! After a sunrise camel ride and breakfast at the camp, we hit the road back north. We stop at a store where they transform slabs of rocks containing ancient fossils into beautiful table tops , plates, dishes etc. Millions of years ago , Morocco was under the ocean and the area at the edge of the desert has an abundance of fossilized sea creatures in the rock beds e.g. nautilus and trilobites. The gorges of Toudra – a popular place for the locals to cool off in the cold river water and picnic in the shade. A highlight of Ouarzazate is the Kasbah Taouirt, the fortress which belonged to T’Hami El Glaoui, legendary Pacha of Marrakech during French occupation, who entertained guests such as Winston Churchill and Charlie Chaplin. Built in the 19th Century, it is possible to visit the ancient apartments of the Pacha, his dining room, and his concubine’s chamber, and admire the delicate stucco ornaments and cedar wood carved ceilings. Also in town is one of the largest film studios in the world – Atlas Film Studios. Gladiator, Kingdom of Heaven, Ben Hur, King Tut, The Passion and some Game of Thrones scenes were filmed here. On the road to Marrakech we visited the UNESCO Heritage site of Ait Ben Haddou. Some of the movie Gladiator was also filmed here. Last night in Morocco in Marrakech – one last wander through the medina for last minute souvenirs including some exotic spices for us to try some tagine (popular stew like dish which is named after the earthenware pot in which it is cooked) cooking once we’re home!